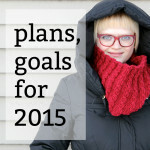 Last year began with me sharing some plans & goals for 2015, which was something I was new to sharing as a blogger. Much like looking back at the top posts of last year, I enjoyed reading through last year’s post and taking stock of what I improved on, and making note of what mayyyyybe totally fell through the cracks a bit. 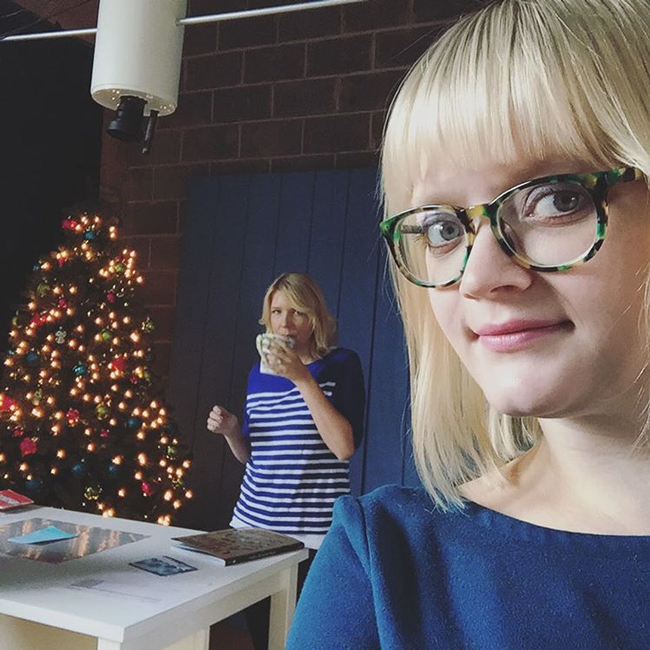 Let’s start 2016 on the same self-aware footing by taking a look back how I did with my 2015 goals, and then we can look at the year ahead and what I’ve got in store for all you yarn lovers! For context on all of this, visit last year’s goals post. After experimenting with veganism (which is really hard, even for someone who hasn’t eaten meat in several years, let me tell you! ), switching to cloth napkins and handkerchiefs, and using home cleaning products with primarily natural ingredients, I think it’s safe to say I made great strides with being a more thoughtful consumer. No, I didn’t find success with my vegan eating, but I think if I continue on this thoughtful track of consumerism, I can make up for my inability to give dairy the boot. I did manage to cut my egg consumption down to the very occasional baked good or sandwich. I also fully gave up coffee for tea, so that went as planned. Yay! Unfortunately, I didn’t do very well at being more focused at all. I was sick regularly throughout the fall, by Christmas I’d begun averaging 4 hours of sleep a night, and it was clear I’d taken way too much on. There’s totally something to be said for work/life balance, and as you’ll see in my new goals for 2016, working on focus and balance is a priority for me. 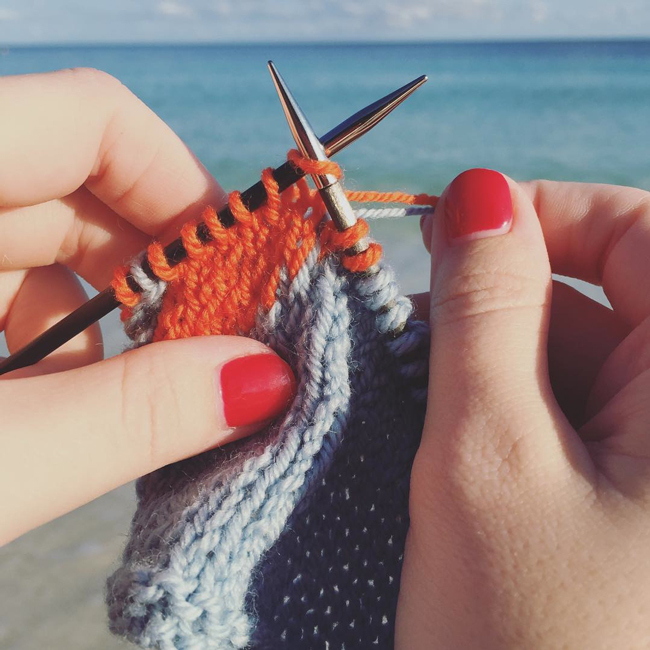 knitting on the beach in the Bahamas – such a dream! The days when I got the least sleep and was the most stressed tended to be when I was fulfilling my goal to visit family more, travel more. My husband and I got a killer Groupon for a trip to the Bahamas this fall, we did some super fun weekend trips around Illinois, and even celebrated the end of summer by going to Denver for a long weekend. The Denver trip was when we got to meet some dang yaks, which was completely epic. I want to visit the Bijou Basin Ranch again right now – it was so amazing! PS: I highly recommend Colorado to anyone wanting to geek out about yarn. 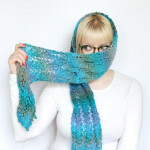 There’s so much great indie fiber stuff going on there! We also made it to see family in the four separate states they live in, so this goal was a success! 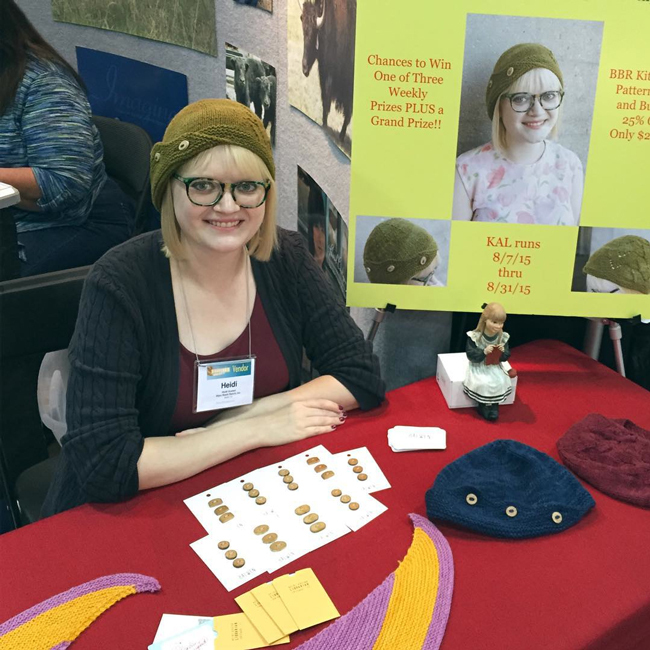 Me sitting next to a poster of myself at the Bijou Basin Ranch Stitches Midwest booth. Weird. Workflow-wise, attempting to cowork made me realize a few things. One, I’m not good at staying focused when others are around. Two, I’m a much bigger introvert than I realized. Before coworking, I’d completely taken for granted the fact that the days I don’t work at the library are days I value and kind of need. Alone time is my BFF, and my productivity BFF. Speaking of productivity, designing more and expanding were NOT a problem for me last year. Opening an independent pattern shop, check. I actually think I hit capacity and then some on design work a couple times, so I’ll have to be more thoughtful about what sort of work and partnerships I tackle this year. That whole life balance thing again – are you sensing the theme here? So, a book. I realized about 1/3 of the way through 2015 that I wasn’t ready to pursue that monster project. I wanted to become a more seasoned designer, so I reached out to my agent to let her know to I was putting a pin in that dream for awhile. Right now though, I’m feeling good about bringing this project back to the front burner in 2016, so stay tuned. Last January’s Knewbies series helped me with my goal to do more videos. 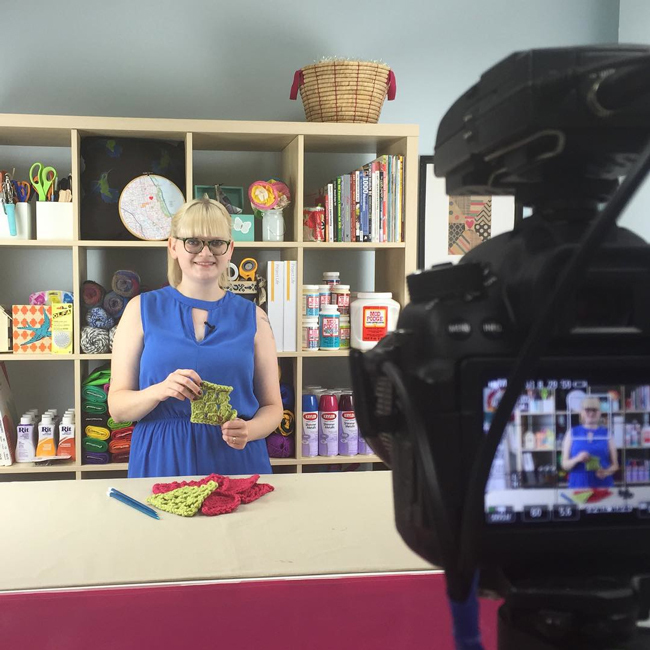 I also became the host for the AllFreeKnitting YouTube channel, two designer friends and I launched a YouTube knitting show called YarnTalk, and I started hosting knitting and crochet videos for Blitsy. 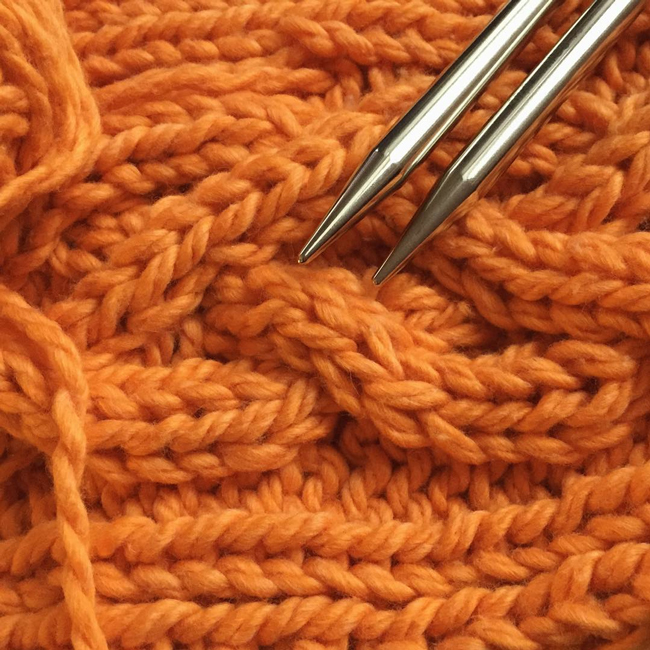 I’ve been working hard to listen to you more by being active on my Ravelry group, in the comments section, and across social media. There’s always more room for improvement, so this one will I think stay on the ole goals list for… ever. Personally, I’m hoping to continue my momentum of thoughtful consumerism. Still try to take it easy on the animal products, other than yarn. There’s so much I cannot control, or in some cases even know, about some of the supplies I am given to work with that being as careful as I can in other areas of my life is increasingly important to me. It’s hard wanting to reduce one’s carbon footprint in a world where so many of the mechanisms in place to get everything (from sustenance to clothing to, yes, craft supplies) to the consumer shroud the ickiness of it all. I don’t want to get to ranty or preachy here on my yarn-filled blog, but suffice it to say that coming up with practical solutions to the conundrums of consuming will remain important to me for a long time. I have no desire (or need, thankyouverymuch) to loose weight. I really just want to eat healthier and exercise once in awhile. It’s so easy to be a cheese pizza vegetarian, but I’m going to try actually getting the vitamins one is supposed to get in a healthy diet. I’ll still eat pizza and ice cream and beer and candy, but maybe 2/3 of my daily meals can be plant based instead of 0-1/3. 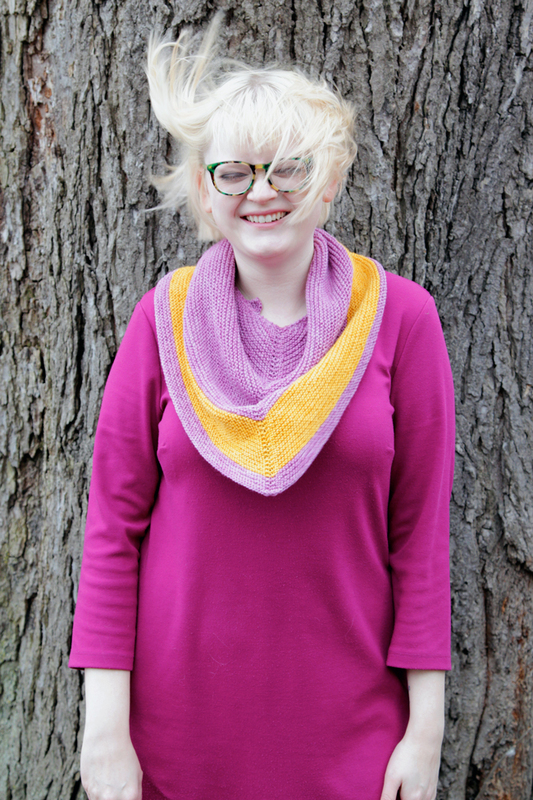 My first FO of 2016! Don’t take on design work with too quick a turnaround – the work will suffer. If I’m not super excited about a partnership that involves design work, don’t do it. The work, and I, will suffer. Don’t forget that I work at an emotionally taxing job half of the time that has nothing to do with yarn. As I’ve said in the past, I work with minors as a public librarian, so I can’t say too much about my job. However, it’s hard to come up with or even work on a brilliant design idea when you’re contemplating whether or not a child you work with is safe. Like I said above, I want to write a book, which is for sure going to require much of my design energy. I must not spread myself too thin. Also, like many young women, I need to work on saying no and to stop apologizing for no reason. I think my work-life balance efforts should help train me on these. 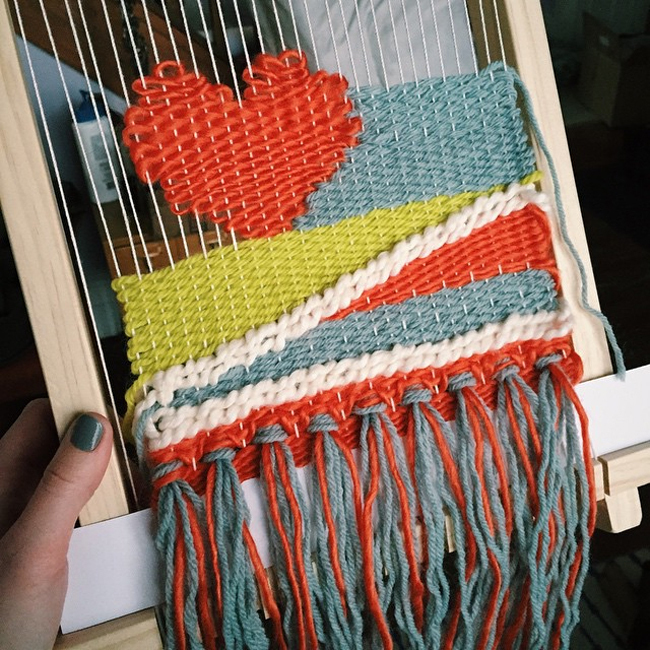 Weaving is so fun! I must do more! Talking design work brings me to blog content. 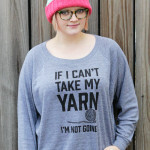 I need to do a better job of keeping the yarn craft alive and well on this blog. I know some of you are here for more than just knitting and crochet patterns. Based on the stats I ran for 2015, you all loved the weaving project I shared, so I’d love to share more yarn craft ideas like weaving, how to make crazy pom poms, macrame, and other crafts that use yarn. That sounds really fun! The last big goal I have for 2016 merges my librarian and knitting skills. For a long time, I’ve wanted to host a read along/knit along project. I have a book in mind, but I don’t want to announce it quite yet. As a teaser, I’ll say that knitting plays a terribly charming role in the book I’m considering. At the moment I can’t decide if it would be fun to do a summer reading-inspired KAL, or if it makes sense to save it for fall. Let me know in the comments if you have any suggestions on the timing, or if you even have a book you think might unseat my top-secret, tentative pick. Video will continue to be a priority for me in 2016. Luckily, I’ve already put out one video tutorial this year on the Hands Occupied YouTube channel, I’ve signed on for another year of hosting videos for AllFreeKnitting, and I’ve landed a monthly contract with Blitsy, which includes some live video hosting work, which is scary but really fun and exciting at the same time. So many things to be excited about and stay tuned for! 2016, I’m comin’ atcha! I’m so happy to have met you in 2015 and love to hear your ideas for 2016! Holy Cow! I can’t believe you did all of that in one year…..while working a day job. Goodness gracious. Amazing! I love the weaving photo, too. Really pretty project. Off to check out some of your other work. I’m so glad to have met you, Heidi!